Okay, I'm a sucker for black alpacas. This beautiful female is packed with powerhouse genetics, not the least of which is my all-time favorite, MFI Peruvian Black Mesquite. Also on the dam's side is 5Peruvian Black Ice 9069. Her sire is none other than MFI Peruvian Formula 1 (Futurity Champ) who boasts Bueno, DonJulio, Mr. President, Augusto in his background. 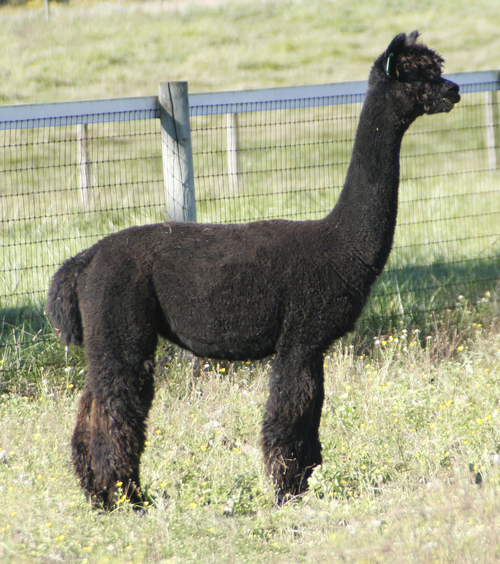 Enigmatic (Matty) has it all........ beautiful phenotype, soft, dense fleece with a wonderful hand and it's black!!!! 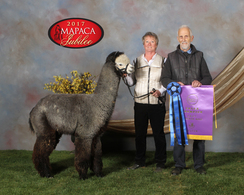 We bought Enigmatic so that we would have another outstanding female to breed to our 6X Banner winning Contender. In July Matty delivered a beautiful black female we have named Cover Girl. Cover Girl has her own listing. Enigmatic is currently bred to Greytness for her 2019 cria.